music ‣ "One of the greatest albums you've never heard." 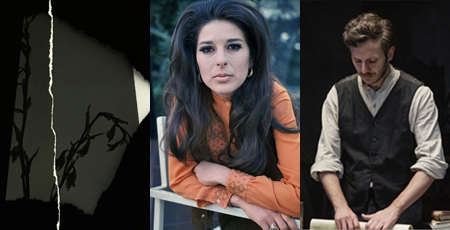 That's how Rolling Stone writer David Fricke describes Bobbie Gentry's 1968 release The Delta Sweete, which Fricke writes is " a connected set of a dozen songs that…sets her folk-siren charisma in a richer frame of dream-state orchestration, swamp-rock guitars and big-city-R&B horns." On February 8, the band Mercury Rev releases The Delta Sweete Revisted, a full resurrection of the lost classic, with a great female singer on each of the tracks. The roster includes Norah Jones, Hope Sandoval (Mazzy Star), and Lucinda Williams. You can pre-order the album here. You can listen to Okolona River Bottom Band featuring Ms. Jones and Sermon featuring Margo Price here. photography ‣ At Howard Greenberg Gallery, Ray K. Metzker: Black & Light, an exhibition of over 50 works by the late photographer in which light and shadow are cast in the starring role. movie ‣ Who Will Write Our History tells the story of story-telling in the most dire circumstances—the Warsaw Ghetto—in which resistance came in the form of pen and paper. Written, produced and directed by Roberta Grossman, the documentary plays the Quad from January 18-24.
theater ‣ The talented composer Tom Kitt has the written the score to Superhero, a new musical beginning performances on January 31 at 2nd Stage, directed by Jason Moore (Shrek, Avenue Q). food ‣ Undo It! : How Simple Lifestyle Changes Can Reverse Most Chronic Diseases by Dean Ornish and Anne Ornish is an excellent addition to the growing number of books (such as How Not to Die: Discover the Foods Scientifically Proven to Prevent and Reverse Disease) that lay out the case for, yup, diet and exercise. What's new in the past few years is just how powerful eating well is in preventing and reversing maladies.